East Hardy kicked off the 13th annual Bub Riggleman Memorial Softball Tournament at the Moorefield Town Park on Friday with a 12-4 loss to Class AAA Hedgesville before returning later to tie Class AA North Marion 5-5, then started Saturday morning with a 3-3 tie against Class AAA Musselman and was eliminated by Class AA Petersburg 8-nil. “It is very special to be a part of this tournament. It is nice to be close to home, so our fans can come and watch us play. It is good ball, all the teams are pretty solid here. Brooke Miller did a great job on the mound. We had some mental lapses and fell apart, but they really showed heart in the second game fighting back. I am proud of them pushing through,” East Hardy coach Ashley Taylor remarked. The sun was shining for this tournament which was a blessing considering the rain in previous tournaments, but a chilly wind kept the temperature down. Hedgesville pitcher Emma Turner issued a full-count walk to East Hardy leadoff batter Lexi Strawderman. Julia Hahn hit a single into center field for the Lady Cougars, but the throw home was in time to prevent Strawderman from scoring. 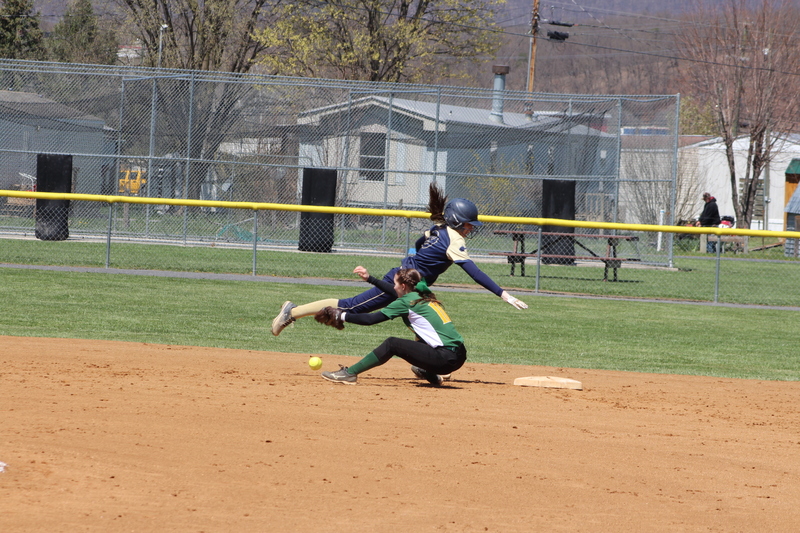 East Hardy’s Skye Metzer singled with the help of the Lady Eagles first baseman stepping away from the base on the catch prior to being stranded as Brooke Miller’s shot was caught at the fence and Leanna Basye popped out. Brooke Miller led the Lady Cougars from the pitcher’s circle and the defense helped to limit attacks as scoring didn’t commence until the fourth inning. Hedgesville’s Alyssa Parks made an infield single and Kelsey Turban reached on an error, but both were stranded on a groundout. In the second inning, East Hardy’s Emma Baker singled on a blooper along the left field line and Jessica Smith followed on a fielder’s choice with Baker arriving safe at second base. The Lady Cougars failed to capitalize on the base running as Rebecca Whetzel struck out, Madison Strawderman hit into a fielder’s choice out at third base and Lexi Strawderman grounded out. Hedgesville’s Alexis Barnhart drew a leadoff walk, then Turner executed a bunt single before Kailan Haught bunted into fielder’s choice out at third base and Miller threw a strikeout prior to Emily Yates catching the last out. Metzer doubled into left field with one out in the third inning, then Miller reached on an error at shortstop. East Hardy missed the chance to score as Basye and Baker hit into fielder’s choice outs at third base. Parks smacked a line drive to third baseman Baker, who made the catch despite injuring her hand in the process and Whetzel came in as her replacement. Hedgesville’s Miranda Payne singled into right field and was stranded on a strikeout and groundout. Things heated up in the fourth inning as East Hardy took a 2-0 lead, but the Lady Eagles responded with five runs for the advantage. Smith reached base on an error and advanced to second on the play to provide the Lady Cougars with a spark on the base path and moved to third base on a sacrifice bunt by Whetzel. Madison Strawderman hit into a fielder’s choice as Smith was held in check and by the time turning back created no play for a throw. Lexi Strawderman knocked an RBI single into center field for the initial East Hardy lead and Hahn added to it with an RBI sacrifice fly in center field as well with the throw coming too high at home. The side was retired on a pop-up by Metzer at first base.